Take Fort Wayne exit 105. Turn left at the light onto Illinois (14) Road. At second light turn right onto Getz Road. Follow Getz Road to Covington Road. Turn right onto Covington Road. Go 1/10 of a mile. Look for the Orchard Gallery on the right side of Covington Road in the Covington Shops. Go west on West Jefferson. West Jefferson is also US 24. Go past Jefferson Pointe Shopping Center. The next light after the last light for Jefferson Pointe is at Times Corners. Immediately past the Times Corners enterance, veer off to the right between Pizza Hut and BP Gas Station. This is Covington Road. Go past Getz Road. Go 1/10 of a mile. 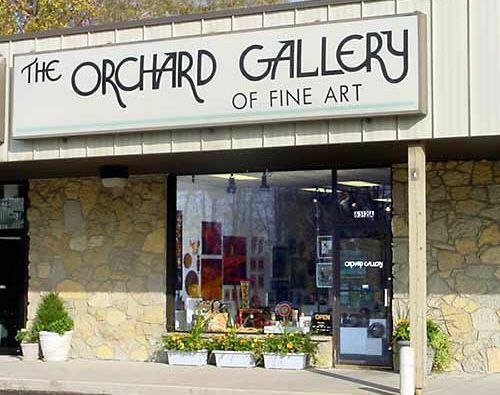 Look for the Orchard Gallery on the right side of Covington Road in the Covington Shops.